Asia and the Pacific region are particularly affected by displacement: 3.8 million people are under the mandate of the UNHCR and millions of these are internally displaced people (IDPs). The causes of displacement in Asia are multiple and go well beyond what is covered by the international protection regime for refugees. For this reason, the study (in German) argues that—especially in protracted displacement situations—not only humanitarian action but also developmental approaches are required. Methodologically, this study differentiates between six regional clusters and categorizes the predominant causes of displacement for each. Clusters are based on a weighting of factors that affect displacement, distinguishing between political, socio-economic and ecological factors. 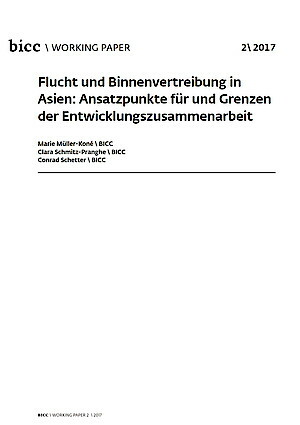 Based on this approach, the authors discuss the limits and opportunities of development cooperation in tackling the causes of displacement in Asia. Development cooperation needs to acknowledge its limits in preventing displacement and must go beyond the containment of its causes by strengthening the displaced persons as well as the receiving communities.